What is forbidden in other cities? Visit the 172 daily photoblogs all around the world to find out! This is great! Of course, pool rules. I've never agreed with the no fins/no masks rules, but at least you don't often see the annoying hair cap restriction much these days. I'd forgotten all the pool rules I was paid to enforce as a life guard during summers in college. That one about wearing proper swimming attire was missing from my pool's sign the day the nice lady at the resort decided to stop taking her lithium and stripped down poolside while all the parents and kids and teens slowly got out and made their way to the exits with no coaching at all from me as the lady dived in. It took our 6'2" head of staff to finally coax her out into a waiting blanket. This sign is a nice reminder of summer days! goodness, what killjoys, imagine a visit to a place like this without roughhousing! We were too late to register, but posted ours anyway. Gee, not only roughhousing (haven't heard that in ages! ), but no flotation devices? Now that does seem severe! Isn't it almost funny to think of adult people scurrying around their communities taking pictures of signs. And if somebody had asked what that is all about and you said a sign with "no" on it, they might... well. It is kind of funny. Great capture Jenny and happy theme day! The last one should have said NO FUN. 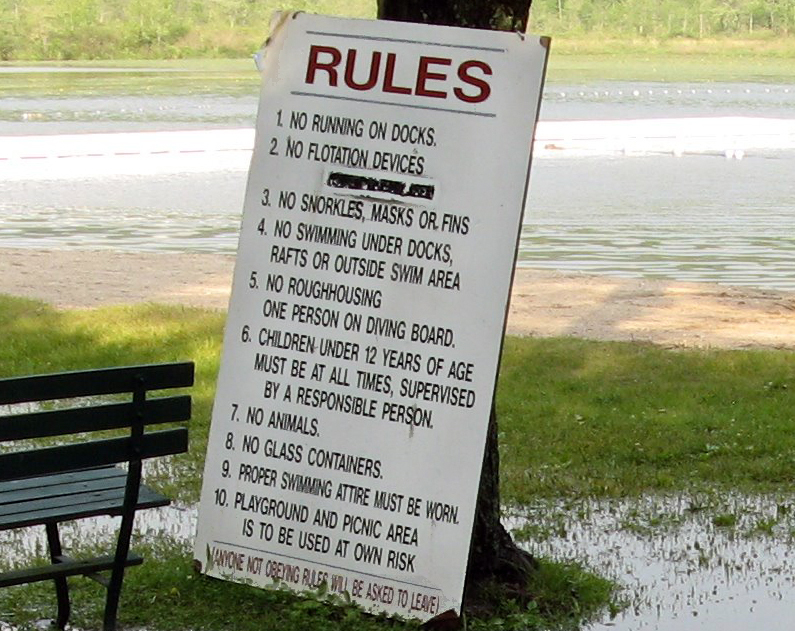 Most of these rules are so hard to enforce with children, especially the running. Well, as long as whoever posted the sign was so nit-picky about prohibited behavior, let's be nit-picky back. What is the penalty for violating all of these rules? You will be ASKED to leave. Does that mean you can reply by saying, "No, I don't care to leave, but thanks for asking." Also, if the playground is not located in the picnic area, it should have said "playground and picnic area ARE . . ." rather than "IS". Such a long list of prohibited conduct is a contrast to a place like Tamarindo, Costa Rica, where they have not gotten around to putting in any traffic lights or parking meters yet, so they certainly have not even thought of puting in many "no" signs. I posted a sign where they tell you not to walk into a bubbling volcano that is hotter than boiling. I don't think anyone would dispute that should be prohibited. Excellent sign! Obviously someone violated each of these at some point and a rule ensued. Isn't that how it always works?